Fifty-five people were injured on Friday by the derailment of three coaches of a train south of Cairo, Egypt's health ministry said. "Fifty-five injured have been transferred to emergency care but the accident did not kill anyone", deputy health minister Ahmed Mohi al-Qassed told AFP. 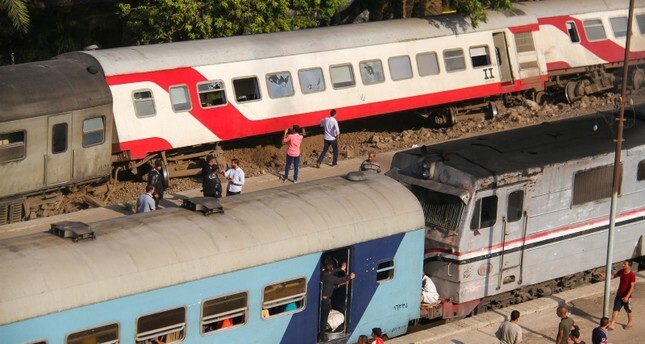 The public prosecutor's office has opened an investigation to determine the cause of the partial derailment in the Badrashin region, 20 kilometres (12 miles) south of Egypt's capital. Serious road and rail accidents are frequent in Egypt, due to chaotic traffic, old vehicles and poorly maintained transport networks. More than 40 people were killed in an August 2017 collision between two trains near Alexandria, in northern Egypt. This train accident was the worst since a 2012 collision between a school bus and train killed 47 at a level crossing in Assiut province. The deadliest train accident in Egypt's history came in 2002 when a train fire killed 373 people 40 kilometres south of Cairo.